Max Slat Privacy Slat, PVT Privacy Slat, Bottom Lock Privacy Slat. Fence Weave, Hedge Privacy Slat, Reflective Slat and Winged Privacy Slat. Privacy, windscreen, shade, dust control, sports, landscape, greenhouse, winterizing, tent covers, shelter covers. Safety top caps are ideal for park and ball field safety. Full color fence murals and logos can be applied to any of our windscreens. 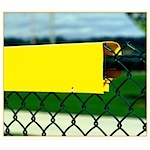 Print corporate logos, team logos, architectural renderings, mascots or anything you'd like to display on your fence. Fence logos are one of the most cost effective forms of advertisement that you can buy, especially in a high visibility area.